This is my favorite desert tower route. Now all free, with a well-protected crux, much Eldorado Canyon-style face climbing on fine rock, cheek-clenching exposure (or is it fine exposure and cheek-clenching rock? ), and a classic flat summit. The regular route (the only other route, on the south side, has aid and is likely unrepeated) is a true desert classic, combining a sense of history and exploration with technical high quality pitches.Start on the northeast corner, under a big clean dihedral. 1. Scramble over some blocks then jam and stem up the dihedral to the roof. Great gear. This is about 5.9/5.10-. Then awkwardly lurch rightwards under the roof, a tad harder, to a blind reach for, well, whatever you can grab out on the face. Launch up a short steep wide section (5.10b/c) to easier ground, where the impacts of so many groping hands and feet, over the years, have removed all traces of the traditional kitty-litter.Saunter up to a tiny exposed ledge and fixed anchor. Double ropes help protect this pitch. 2. Comb your hair and brush your teeth for the photo-op traverse. After this rightwards stroll, launch up a blocky and sustained right-facing system. Again, two ropes and liberal use of slings here is a good idea on this long pitch. There are several moderate 5.10 boulder problem moves between rests, then the crack angles up and left past a steep weird section, then passes a relic of an old fixed anchor. A belay here is possible, but will be hanging and awkward. Best to boldly keep going up the slowly steepening terrain above. Angle up and left into a squat dihedral, then exit this up and right. Wires are surprisingly good here, though be careful to use adequate slings as the placements are often hidden in recesses and funny horizontals. A final funky bulge onto a great ledge completes one of the better trad 5.10 pitches anywhere. 3. The Token Sport Pitch. This has a short but burly overhead-bolt protected 5.11c crux, just above a nice rest ledge. Actually this is hardly a sport pitch; there is a very funky move off the belay to get onto the rest ledge. Once above the crux, more steep 5.10 Eldo-style face climbing with wires for gear gains a crappy old bolt and a mantel onto an elephants-ear flake. If the elephant is in a kind mood, which it usually is, the flake will stay put, and you can belly-scrape up onto the next belay ledge. However this elephant appears to have some form of leprosy, and one day the ear will detach itself. In fact one day the crucial hold at the 5.11c crux will also go south (or north in this case) and this pitch will be rather harder. Once on the ledge, you can relax, all the hard climbing is over with, and while your partner leads the 5.8 glory pitch up and right to the easy finish, you can lean over the void below and envisage the scene should the whole tower topple. If it did, it would fall south, and the climbers would be left with a few seconds of quiet contemplation and a whistle of the wind, before the end. Maybe, just before the tower hit the ground, if you jumped up with enough force, you could actually land unhurt on the debris. Wow, wait a minute, the ropes are suddenly tugging, and off you go easily up the last pitch. Or if your partner is Jonny Copp, he'll not be satisfied with the regular finish, and you'll find yourself struggling up the direct finish. Hmmm. This wasn't in the script. Hideously awkward mantels and steep face, very solid 5.11, lead straight up to the nice new rap bolts. The summit is a very cool place to be, where the silence is loud, and everything else is very small. There is still a register under the cairn, though the sequence of ascents is pretty hard to figure out anymore due to the assortment of broken pencils, torn candy-bar wrappers and oddments with odd scrawls. Bring more paper! For me, it appears I am competing with one Jimmy Dunn, who has also been up here four times. The rate of ascents is interesting. Maybe ten or a dozen ascents a year now. One a month. A total of about 100 ascents is my guess. Rap the route. Two 60 meter ropes gain the top of the second pitch. Fron here, rap to the top of the first pitch, then again to the ground. Get ready for the drive from hell; it's a loooong way to the Moab Brewery. Kor and Ingalls may have done the first ascent, but Castleton Tower it ain't. Nearing the end of first pitch. Ian McAlexander on the first pitch. Standing Rock. Photo: Todd Gordon Collection. P1 - up the dihedral, exit right. Additional approach beta: the gully is definitely the way to go. Note also that it is to the NW, and not NE of the tower. Walk to the rim and poke around a bit and you'll find the anchor and a somewhat useless fixed rope in a chimney leading down a 20 foot step in the caprock. You are aiming for a descent gully with a house-sized boulder in it. Jumars and your own rope to fix aren't mandatory, but they certainly are nice since the fixed rope is knotted with small loops for clipping daisies, and isn't easily rappelled or ascended. For the overall experience, this is quiet possibly the best desert tower. I found Crusher's description of the route to be spot on, though he does understate the intensity of the climb. Although it is only 300 feet, it is definitely a grade III. I thought the first pitch was certainly solid 5.10 and the second pitch is very sustained and steep. The third pitch isn't really that bad. It's short and the crux is only a boulder move. The flake at the crux move, however, is definitely going to break on someone, probably soon. Yarding on the elephant ear flake isn't hard but it is griping when the flake flexes a quarter inch as you pull up onto it. Rack: 2 sets of camalots from .5 to 3. No big cams needed. 1 set of TCU's (00-4). 1 set stoppers, including RP's. Notes: The aid on pitch 3 is fairly straightforward, with one good bolt, a decent drilled angle, and some scary old hardware (nails). If free climbing, I would fall only on the bolt, as the rest of the pro above it is, well, crap. The elephant ear flake is still there, but it was creaking, and I barely weighted it. I felt that with a nut tool I could have pryed it off. Anchors: Top of P1 has two bomber bolts and chains. Top of P2 has a jumble of crappy old stardrives, angles, etc; 5 piece in total. Top of P3 has one decent SMC bolt, and two scary nails (or was it one scary nail and one stardrive?). Either way, this belay is choss, and probably would not hold a good whipper. Best option is to link P3 and P4. Just use long slings to avoid drag. Top of P4 has 2 bomber bolts with chains...but these are just over the lip of the summit, so belaying off them will be hard if you don't climb the direct finish. There are a couple of pieces (I believe one drilled angle and a stardrive) on the summit proper from which you could belay instead. Raps: Rap off the bomber rap anchors at the summit with 2 60m ropes to the top of P1. Tie knots! Rap to the ground. What we did was take the old closed road, and descend a gully with some 4th class moves. (Routefinding needed) Cut left and your at Standing rock. We brought doubles up to #3 and a #5 (proved useful on 1 pitch) Some funky moves on the rock but amazing. Rock is great for this kind of area. There are some runouts on each pitch but nothing to dangerous. Just enough to be spicy. Get on it before it falls! You won't regret it! Elephant flake was in a good mood still. It's going to come off soon though. Beware of storms. One approached us on the summit out of no where. My partner had a static feeling. I climbed this route on June 12th and found it to be an excellent summertime choice when everything else is too hot. Upper 90s in Moab that day but perfect temps on route in the morning shade. The route does get sun after maybe 2 or 3. The fixed rope was still there and in descent shape. The elephant was in a good mood and I think will remain in a good mood for many years. APPROACH (for fixed rope): After driving roughly NW along the edge of Monument Basin (first edge you come to) for maybe a mile the road makes a slow curve to the left and continues along the edge heading SW. Almost immediately after this you will cross a long slickrock section where the road gets pretty near the edge (maybe 50ft). You can also look out your window and clearly see a beautiful arch from this same slickrock outcrop. From the arch view, drive a little less than than a mile to where the road crosses a hopefully dry stream bed (steep little hills to drive over on each bank). Cross over the far bank and park in a small left hand pullout a little beyond it. From here hike 200 feet or so to the obvious rim where you can clearly see standing rock. Hike to the right (when facing Standing Rock) along the edge of the rim for about five minutes (no trail or cairns) to the descent gully. There is a cairn on top of it, the fixed rope is visible from the top, and as the above poster mentioned, you can see a house sized boulder about halfway down. You can't see this descent gully until you're practically on top of it. Once down in the basin, traverse the cliff bands around to the right until you can walk down into the creek. CLIMB: The above posters did a great job describing this. I had a double set of Camalots to #3, one fist sized piece, and nuts. I felt the crux was definitely harder than 11c to free. Maybe 11c if you were taller than say 5'10" or had freakishly long arms. I got it after several tiny falls and felt it was similar to a short V5 boulder problem. Or just pull through. DESCENT: We descended easily with one 80. On the long rap down to the top of pitch one there was maybe 20 feet of rope left on either side so it seemed a single 70 would also just make it. Jake's beta is good for the fixed line approach but here's a little to add: The section of road where you are driving on slick rock and are very close to the edge of Monument Basin, with the arched tower visible, is a great landmark. It is .7 mile from that arched tower viewpoint to the pullout. There is a wide, sandy wash you cross with steep sandy driving on both sides of the wash. We pulled into a small wash on the left (pictured below) just after that wider sandy wash. I think that's the same pullout Jake describes but it wasn't obvious to us because it just looked like a wash, to us, and there were no tire tracks in it. Just past this wash/pullout is a super steep section of slick rock and that means you've gone too far. It's a steep section of slickrock that will give you pause and most likely would require 4WD to get back up. Standing Rock fixed line approach pullout. Also, we had read the comments about the summit needing a new register so we brought one up, although someone else had beat us to the punch. Either way, there is now a good register up there. Also, it was a rope stretching 100 foot rappel from the top of pitch one to the ground. Call it 102' and tie knots in the end if you're going to rap that section with a single 60. We climbed this route in a day from the Grand View Point parking lot. Car-to-car time was 9:45. The descent took us 3 hours (not knowing where we were going) and the return to the car took us 2 hours. We were not going fast. We only brought a 70m rope to the climb and it was an easy 3 rappels to the ground. We brought a 60m rope for the rappel from the White Rim but did not use it. We found the fixed line/gully descent and the line was only about 20' long and in great shape. If you wanted to bring a rope just in case, you'd only need about 20'-30' of rope. A great climb. The rock is more like stolen chimney/ancient art than other towers. First pitch is pretty straight forward. Second pitch--average climbers getting on this thing ought to be able to climb up to the roof without pro, negating the need for back cleaning. The roof is awkward and obscure. Above, the climbing is runout, and you will pass two intermediate anchors before arriving at the 4 pin + stardriver ledge. The business is at the start of the second pitch. Pray for anchor integrity. Above the good bolt is more climbing that might remind a few of the Gunks yellow wall. Don't fall, but if you do, have a prusik (questionable gear with a big overhang). There are two flakes at the end of this pitch that are loose. One is huge and could do damage. The last belay is poor--we skipped it and went to the top. The approach. We found the directions pretty good. A decent 4wd is probably necessary. 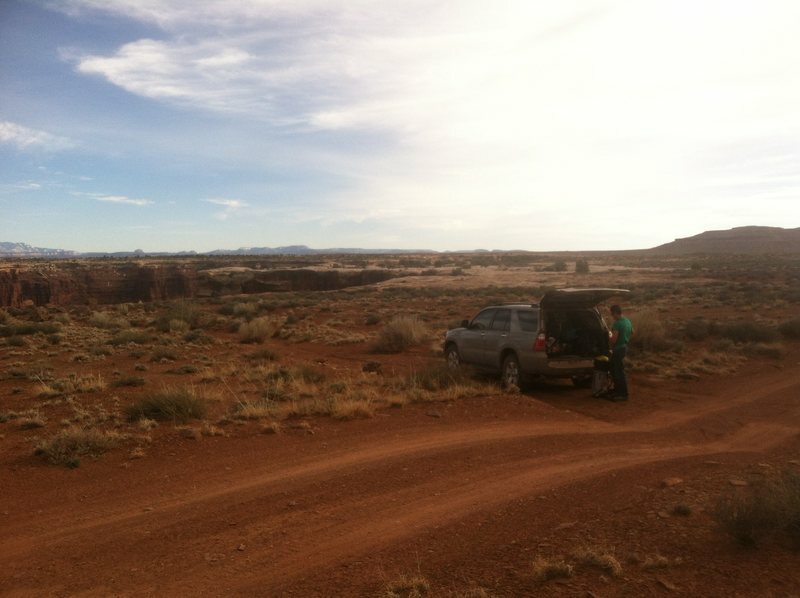 The wash we parked in was close to a mile past the view of the "arch tower". This is about 3 hours from the visitor center. From the car, head off a bit right--maybe at 30 Degrees---until you reach the edge. You should be close to a small--4 ft ravine--that turns into a larger chimney about 15 feet down. There are anchors and a fixed rope--new--to get down another 20 ft.
P2 anchor could really use a real bolt and maybe some chain. It's just a star drive and tied off half driven baby angles and the possibility of a factor 2 fall is pretty real.